Floor standing version of the popular Monaco arch shaped headboard with self-coloured edge trim and 20cm / 8" high pillow board which allows the pillows to sit snugly with the headboard. Available in our full range of Upholstered, Faux Suede and Faux Leather fabrics. All of our Faux Leather Floor Standing Headboards are available in all UK Standard bed base sizes; 2ft6 Small Single, 3ft Single, 4ft Small Double, 4ft6 Double, 5ft King Size, and 6ft Super King. 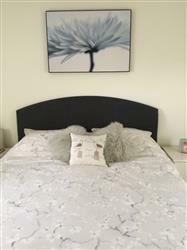 Note: Main image displays this headboard in Gem Slate. This is a beautifully made headboard which is not as deep as some but quite deep enough. It is properly made without some of the usual cut corners and in my view very good value for money. I will be ordering again from here. I took a chance on ordering on line and I am very impressed. The samples arrived really quickly and the headboard (freestanding, curved in granite fabric) did not take long to arrive at all. It looks great. We are very happy with the service received form the Headboard store. The headboard arrived within the timeframe promised and is excellent quality. Good service and very decent quality. Was worried about not having seen the fabric, but it is much nicer than expected. Lovely headboard all together!